Website: Buy Your Tickets Here! 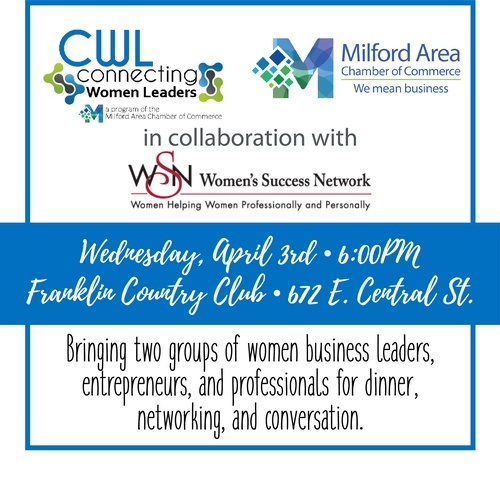 Join the Women’s Success Network (WSN) and the Milford Chamber of Commerce’s Connecting Women Leaders (CWL) group for an evening of cultivating new connections. We are excited to bring these two groups of women business leaders, entrepreneurs, and professionals for dinner, networking, and conversation. Bring plenty of business cards and be prepared to give your 60-second elevator pitch. Guests are welcome!